Foxconn Workers: Please Let Us Work More! After the people Apple hired to clear its name wrote up a gloomy report of Foxconn working conditions, the manufacturer vowed to reform. First up: shorter, legal working days. But now these overworked workers want to keep overworking. What? 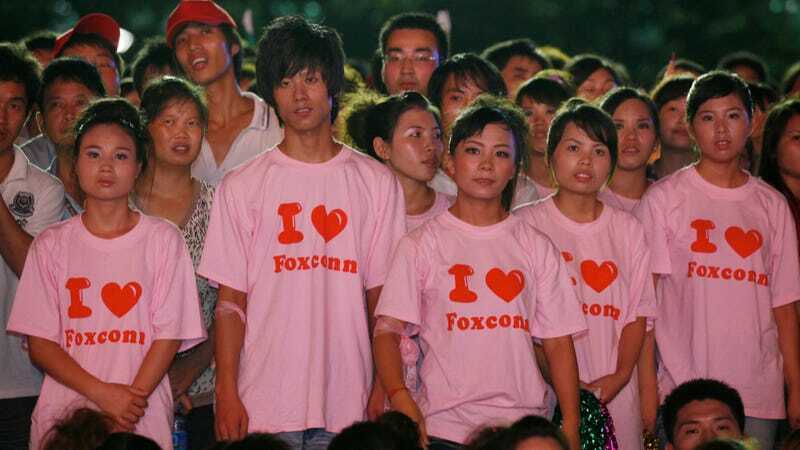 Foxconn's concessions, including cutting overtime for its 1.2 million mainland Chinese workers while promising compensation that protects them against losing income, were backed by Apple. Many workers seemed unconvinced that their pay wouldn't be cut along with their hours. For some Chinese factory workers - who make much of their income from long hours of overtime - the idea of less work for the same pay could take getting used to. "We are worried we will have less money to spend. Of course, if we work less overtime, it would mean less money," said Wu, a 23-year-old employee from Hunan province in south China. • These quotes are either the product of Foxconn fabrication or worker coercion in an attempt at self-defense. • These workers are so underpaid that the only way they actually can get by is through grueling, illegal overtime. • The laborers, 99 percent of which are migrants from brutally poor Chinese villages, would rather spend every waking moment blowing dust off of iPad screens than go back to what they were doing before—the old bad is better than awful rationale.